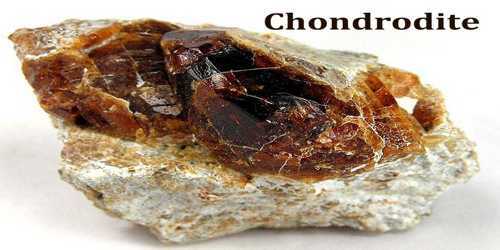 Chondrodite is one of the rarest and most beautiful of gemstones and it is occasionally faceted for collectors. It is a nesosilicate mineral with formula (Mg,Fe)5(SiO4)2(F,OH,O)2. It is the most prevalent and well-known member of the humite group. It is named for the Greek term “chondros”, meaning grainy, alluding to the frequent grainy habit of this mineral. It is also found associated with skarn and serpentinite. 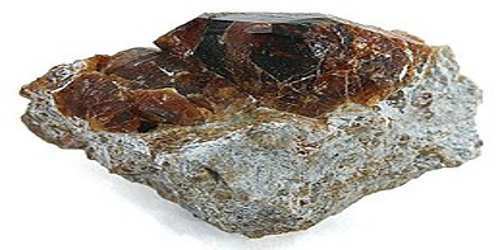 Chondrodite was discovered in 1817 on Mt. 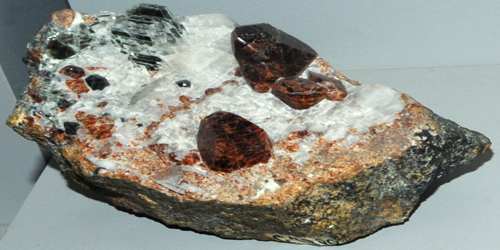 Somma, part of the Vesuvius complex in Italy, and named from the Greek for “granule”, which is a common habit for this mineral. The original chemical analysis by d’Ohsson did not find fluorine, but reported a 100% total. Seybert (1822) analyzed a similar mineral that did contain fluorine from Sparta, New Jersey, USA and named it maclureite for William Maclure, geologist-mineralogist, educator, and philanthropist. A minor controversy arose between Henry Seybert and Thomas Nuttall in 1822-1824 regarding priority of who first found fluorine in maclureite. Eventually, the maclureite of Seybert (1822) was indirectly equated with norbergite rather than chondrodite (Larsen et al., 1928). See also Thomson and Torrey (1836). Chondrodite is found largely in metamorphic contact zones between carbonate rocks and acidic or alkaline intrusions where fluorine has been introduced by metasomatic processes. It is formed by the hydration of olivine, (Mg,Fe2+)2SiO4, and is stable over a range of temperatures and pressures that include those existing in a portion of the uppermost mantle. 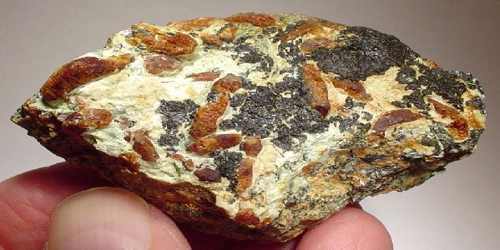 Titanian chondrodite has been found as inclusions in olivine in serpentinite in West Greenland, where it is associated with clinohumite, olivine, magnesite, magnetite and Ni-Co-Pb sulfides in a matrix of antigorite. Mg5(SiO4)2F2 is the end member formula as given by the International Mineralogical Association, molar mass 351.6 g. There is usually some OH in the F sites, however, and Fe and Ti can substitute for Mg, so the formula for the naturally occurring mineral is better written (Mg,Fe,Ti)5(SiO4)2(F,OH,O)2. Chondrodite crystals are usually complex, with faces in an oval “saucer” form. Less commonly tabular, and rarely prismatic. Often in grainy and crude masses. Its structure is based on a slightly distorted hexagonal close packed array of anions O, OH and F with metal ions in the octahedral sites resulting in zigzag chains of M(O,OH,F)6 octahedra. There are three distinct octahedra in the array: Fe is ordered in the M1 sites but not in the larger M2 and smaller M3 sites. Ti is ordered in the M3 positions, which are the smallest, but Ti concentration appears never to exceed 0.5 atoms Ti per formula unit in natural specimens. In the humite series Mg2+ is replaced by Fe2+, Mn2+, Ca2+ and Zn2+ in that order of abundance, though Mg2+ always predominates. Chondrodite is not a particularly common mineral and is never seen in abundance. It is found in hydrothermal deposits and contact and regionally metamorphosed dolomitic limestones, most notably skarn deposits and in some serpentinite rocks. Crystals when found are very complex with many competing forms adding many different and seemingly unrelated faces. Most often the individual crystals appear rounded or granular. It is biaxial (+), with refractive indices variously reported as nα = 1.592 – 1.643, nβ = 1.602 – 1.655, nγ = 1.619 – 1.675, birefringence = 0.025 – 0.037, and 2V measured as 64° to 90°, calculated: 76° to 78°. Refractive indices tend to increase from norbergite to clinohumite in the humite group. They also increase with Fe2+ and Ti4+ and with (OH)− substituting for F−. Dispersion: r > v.